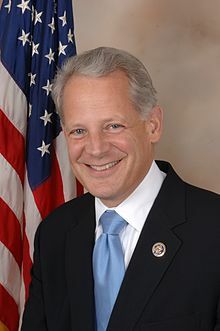 Steven J. Israel (born May 30, 1958) is an American politician. He was the United States Representative for New York's 3rd congressional district from 2001 to 2017. He is a member of the Democratic Party and was head of the Democratic Congressional Campaign Committee until November 2014. In 2017, he joined CNN as a political commentator. ↑ Lambert, Bruce (May 21, 2000). "Fight Already On for a House Seat That Could Prove Decisive". The New York Times. ↑ Rick Brand (January 17, 2017). "Steve Israel joins CNN as commentator". Newsday. Retrieved April 14, 2017. This page was last changed on 26 September 2018, at 03:36.